Part of a series exploring WordPress web development from a client perspective, this will guide you through pre-project research and due diligence you can complete to help ensure the project’s success. 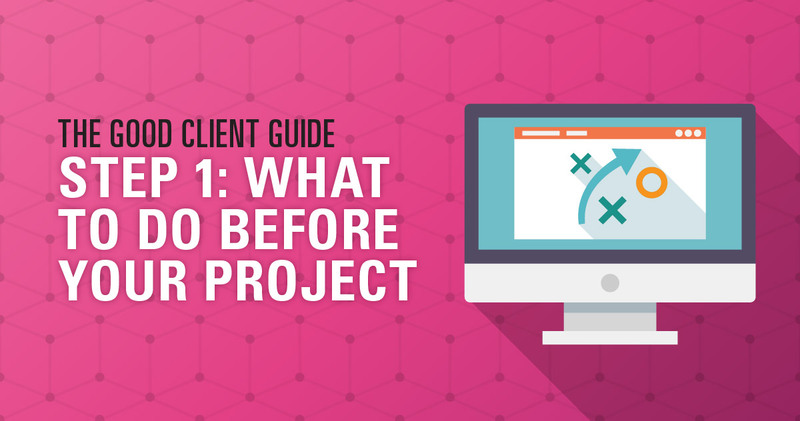 This post is part of an ongoing Good Client Guide series, which serves to demystify the web development process and empower consumers of web design (known to many in the industry as The Client™) to be an informed and effective partner in the process. Missed a step? Start at the WordPress Development Glossary. So you need a website. Where do you begin? You might be here because you’re thinking about building a new website. My guess is you’ve also heard about this great software called WordPress, maybe through some blogging experience, or another website you liked, or an article online. Once you learned a little bit more, you liked the idea of being able to update your content yourself, like adding new pages, words, images, or videos. Maybe you want to do something more complex, like sell products, promote events, create memberships, run a community, or any number of other things. You have an idea of what you want, but you don’t know where to go from here, and you want to make sure that you’re making smart choices and getting a good deal. Congratulations! I’m really excited to be here with you as you begin that journey. It’s probably no secret that I’m enthusiastic about web design and passionate about WordPress. After all, it’s what I do. But more than that, I want to help empower you to navigate this process too. I find projects always run best when everyone is an informed contributor and has a shared understanding of goals. So let’s get started! The beautiful thing about WordPress is that it’s free, open-source software. That means anyone can go to WordPress.org right now and download the latest stable copy to install anywhere they wish, or purchase a low cost hosting plan from a number of trusted sources that’s pre-installed with WordPress, and start publishing to their heart’s content. With a huge number of free or low-cost themes and plugins available, customizing the look and functionality of your site is also easily accessible. Add WordCamps happening around the world offering WordPress instruction and education at a low cost, plus online tutorials and videos everywhere you look, and it seems like this is all something you could definitely take on yourself without the extra expense and hassle of working with someone. And it’s true, many people decide to do it themselves. I spend a lot of time helping teach people WordPress, whether that’s through speaking at WordCamps, helping write tutorials, designing better infographics, or just working one-on-one with someone. It brings me a lot of joy when I can empower someone to build something on their own. However, there’s a reason that I can make a living designing and building websites, even though WordPress is so accessible and we give away so much knowledge. Understanding web design and web development is a full time job. There are many different aspects involved, from learning how to setup existing themes and plugins, to learning how to change the look and feel with styles and markup, to learning how to program and build the functionality yourself. Plus, the industry is constantly changing, and there are always new best practices to follow in the realm of design, development, SEO, accessibility, or security. It’s difficult enough to keep up as a web professional who does this every day, much less try to run another, completely separate business or organization on top of that! I don’t say this to be discouraging, though. Over time, I have found that there is a pretty clear set of guidelines to help you decide whether to learn how to do this yourself, or whether you should hire a WordPress professional to help you. However, many projects don’t meet the above criteria. After all, most businesses or organizations have very specific needs for a website. If your website project contains one or more of these four critical factors, it is time to hire a WordPress professional to design and develop your website for you. Customization: The solution you are looking for does not currently exist “out of the box” anywhere. You have specific needs or specific brand requirements that will require a new workflow, theme, or piece of functionality to be custom built for you. Complexity: Multiple partial solutions may exist, but they will need to be integrated so they function smoothly together. Or, existing and/or custom functionality will need to integrate with other Third-Party services. Or, you have very specific and high level needs for security, managing web traffic, or other problems of scale. Knowledge: You don’t know what you don’t know. What you are looking for may require more knowledge and guidance to select the right solution out of many options that are out there, whether it’s something that exists or something that needs to be built. Mission Critical: Most importantly, the timing, functionality, or performance is crucial to the operation and success of your business. Without the website performing reliably and smoothly, it will hurt your bottom line. By this point, you may have realized that it will be in your best interest to hire someone, and you’re ready to get started. Don’t jump into that just yet, though! What are your Wins? This question is twofold: identify the actions you want people to take on your site (what do you want them to DO?) and what outcomes of those actions would be considered successful. It is also helpful to rank each of those wins by priority. Example: Number 1 win is if they purchase our product. Number 2 win is if they sign up for our newsletter. Number 3 win is if they tweet our latest promotion. If you’re having trouble outlining these things, don’t worry. One exercise I often suggest is to go look at other sites, whether they’re a competitor or in a completely unrelated business, and find the elements of the site that seem to relate to what you are doing, or that you think are successful/compelling. Create a list of these pages (with links) and write down the element you are referencing, as well as why you are pointing them out. Be as specific as you can. You can say “I like the look of this site because it does not seem cluttered” or “I enjoyed the animation when I added the item to the cart because it made the next step really clear” or “This contact form was easy to find and short.” You can even take screenshots and circle or write on them, if you’re comfortable with that. Remember, we are not trying to copy other sites (“Build me a site like Apple”), we are trying to learn about the elements you find successful, and then incorporate those concepts into your specific needs. What works for Apple, Amazon, or even your direct competitors may not work for your brand and your customers. Who will be involved? Who in your company will need to voice their opinions, which departments need to have buy-in, and who has to give approval? How frequently will people need to be consulted? Bringing someone in partway through a project usually results in a major time and money cost as changes have to be made that were already approved. A general rule of thumb is to make sure everyone is involved at the beginning (whether that’s a CEO signoff, financial department approval, marketing department research, etc) and then decide how often each person needs to be involved going forward. Who will make decisions? If possible, assign one person as a point of contact whose decisions will count as the final word. Many people can contribute to the process before this, but the project will go smoothly if there is a single person who has authority to sign off on decisions, rather than having multiple people giving your developer or designer different, sometimes conflicting, messages. Who will be working with them? If you have any internal designers, developers, or similar departments like SEO, copywriting, photography or marketing, make sure they are aware you will be bringing on outside help, and what your expectations are for their role in the process. After all, they may be the ones maintaining or updating the project after it is over. If you’ve made it this far, you’ve done your homework, and you are ready to get started! Next up is Step 2: Hiring A WordPress Professional, where we’ll discuss finding the right combination of skills and size for building your project.